This should have been a slam dunk review for me, but because I love the entire series so much, I had to refresh myself with a complete run-through of the first four books. I do love Bo and Lucky, and this fifth book really puts them through the ringer. Here they’re back from Mexico and a hellacious undercover operation (details in Manipulation). Bo in particular has been damaged by this operation, since their nemesis Stephan has a way of hitting people at their most vulnerable points. Of course, if Bo gets scratched, Lucky bleeds. And Lucky’s not used to caring so much for anyone. This book has so much character growth for Lucky. He has to be the one to keep things going, to be the strong one for Bo, who isn’t used to being down and damaged. He thought he’d gotten past all that when he remade his life, and it’s bitter to him to be the one who needs help now. He has to come back from all the crap the Mexican operation threw at him, and he can’t do it without Lucky, little though he wants to depend on someone else. This is a more introspective book compared to the action packed adventures of the first four, but these two have been through a lot and need time to heal. Watching Bo come back to himself with the help of his commitmentphobic lover, a giant scene stealer named Moose, a smartmouthed agent friend who makes a scary concoction called pot liquor, makes for a heartstring pulling read. Which of course, Lucky being Lucky, comes with a heavy dose of banty rooster cockiness. Bo’s made of layers all the way down, and poor guy is stripped so raw. 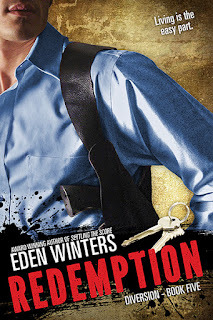 A couple of times I was on the edge of my seat when someone had a chance to make a horribly bad decision, so I can’t say Eden Winters didn’t keep my heart pounding. There’s justice done, and maybe a lingering mystery solved, and very little is as it seemed. Lovely review. "A couple of times I was on the edge of my seat when someone had a chance to make a horribly bad decision..." This is the kind of review that makes me want to go out and buy Redemption and the complete series. Consider this shared on my FB timeline.